How Do I Turn On My Galaxy S5 Screen Without Pressing the Home Button? If you are so addicted to your phone that you cannot put it down for even a minute, chances are you could break your phone’s power button because of excessive use. Luckily, it is possible to turn the phone’s screen on without touching any buttons. 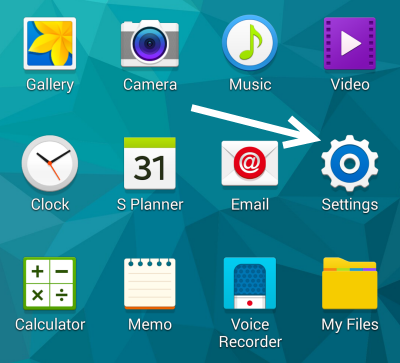 This tutorial will show you how to enable this feature on your Galaxy S5 or any Android phone. Using the Air Wake Up Feature on Galaxy S5: 1. Open the app drawer, and choose Settings. 2. In the Settings screen, scroll down the list until you see the Personalization section, and tap Accessibility to continue. 3. Next, choose the Dexterity and interaction option at the top of the screen. 4. In the next screen, you will find the Air wake up option at the top of the list. This feature allows you to turn on the phone’s screen by just hovering your hand over the sensor at the top near the speaker of the phone. To turn it on, tap the option, and slide the button at the top right of the screen to the right. The green button indicates that the feature is currently active. 5. Exit the Settings section, turn off your phone’s screen, and hover your hand over the top sensor to see if it works. After testing this feature, I found that it works best when the phone is on a stable surface. Waking Up the Phone Without Using Buttons on Other Androids: 1. Open the Play store, search and download the Auto Screen On Off by Daniel Kao. 2. Once the app is installed, launch the Auto Screen Settings app from the app drawer, and turn the app on. 3. Test the app by turning off the phone’s screen and hovering your hand over the top of the phone. Please note that using either the Air wake up feature or the Auto Screen On Off app may drain your battery faster.